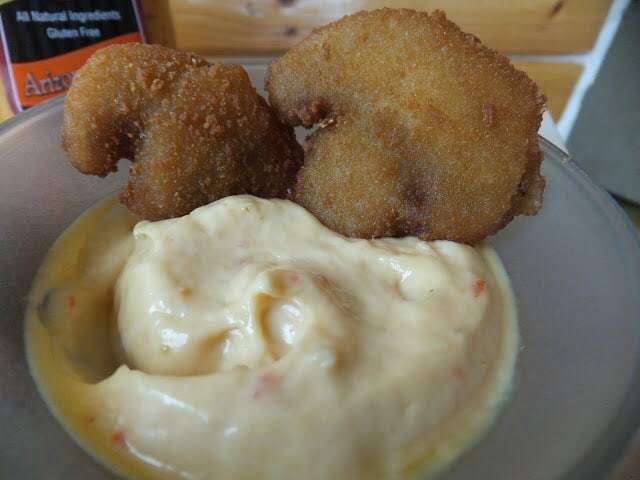 Crouton Coated Beer Battered Mushrooms may sound unusual but trust me, they taste sensational. Fresh mushrooms are sliced into thick slices. A batter is made of flour, beer and seasonings. The fresh mushroom slices are dipped into the batter, then dredged in crushed croutons. The coated mushrooms are deep fried in hot oil until crispy. Use your favorite flavor and brand of croutons. Crunchy and super delicious! 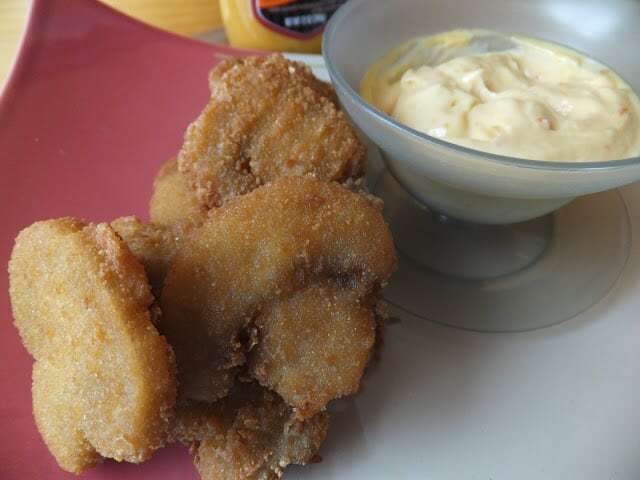 Serve crouton coated, beer battered mushrooms with this fast and easy mustard dip. Not only are crouton coated mushrooms delicious dipped into this dip, deep-fried mozzarella sticks, chicken nuggets, french fries and well, just about anything really! 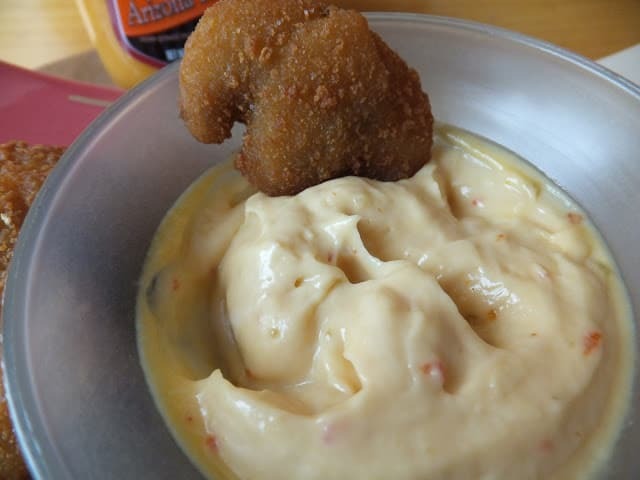 Even mini corn dogs would be great dipped into spicy mustard dip. Mayonnaise and your favorite bottled creamy-style mustard is all that is needed to make this dip. We love and use Koops Arizona Heat. A word about fresh mushrooms. The readily available cultivated white mushrooms have a mild, earthy favor. The cap ranges in size from 1/2 to 3 inches in diameter and in color from white to pale tan. Those labeled “button mushrooms” are a smaller version of the cultivated variety. These common mushrooms are available year-round but their peak season is in the fall and winter. They’re sold in bulk and 8-oz packages. Look for those that are firm and evenly colored with tightly closed caps. If all of the gills are showing, the mushrooms are past their prime. Avoid mushrooms that are broken, damaged, have soft spots or a dark-tinged surface. Fresh mushrooms should be stored with cool air circulating around them. Therefore, they should be placed on a tray in a single layer, covered with a damp paper towel and refrigerated for up to 3 days. Recipe Note: When using fresh mushrooms, keep in mind that mushrooms should never be soaked or rinsed in water . Mushrooms are like tiny sponges. They’ll absorb the water and become very mushy. Before use, mushrooms should be wiped with a damp paper towel and dried thoroughly. 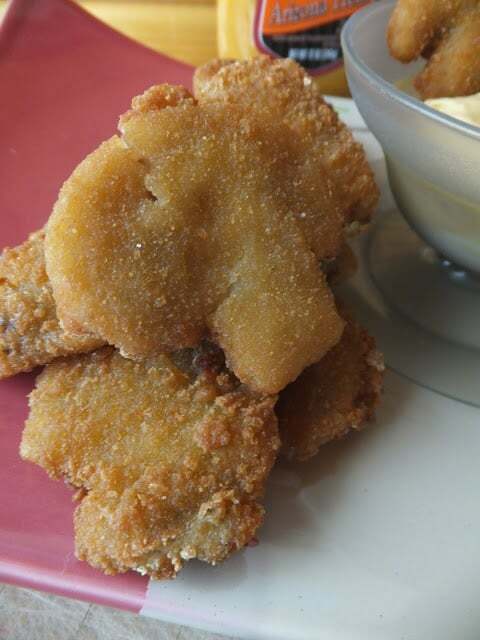 Crouton Coated, Beer Battered Mushrooms are super dipped into Spicy Mustard Dip. Stir together mayonnaise and mustard. Refrigerate until serving time. Dip sliced mushrooms in batter, then roll in crushed croutons. Drop into hot oil, fry until golden brown, 2 to 4 minutes. Drain on paper towels. Serve mushrooms with spicy mustard dip.